Once you have an Elorus account, you can connect it with Slack to receive notifications for various events. In short, all alerts that Elorus displays on your account can now be sent to your Slack as well, for more convenience. 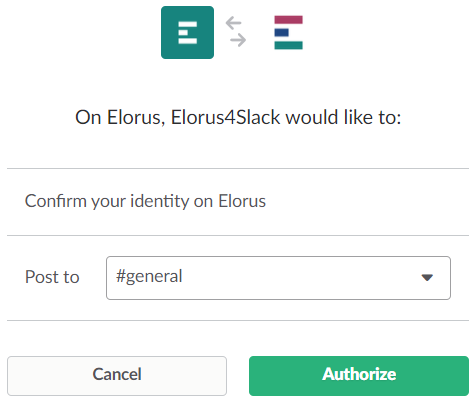 The process of integrating Elorus with Slack is simple. From the "Settings" menu select "Application settings" and then Integrations. At the top of the page, click on the Integrations tab and then click on "Install Elorus4Slack". You are then transferred to Slack's environment to authenticate your account and authorize Elorus4Slack to actually send messages. A new notification is created. Notifications are automatically generated by Elorus each time an important event occurs. You may find out more about notifications in the related article. If you do not want to receive notifications on Slack, select "No" to the "Receive Elorus notifications on Slack" field on your settings page (see image above). A new reminder is sent. As opposed to notifications, reminders are custom messages that may be sent to your team or clients when certain conditions are met. Since reminders are configured manually, you have full control over what messages you receive on Slack; for instructions on how to set up and use the reminders feature, please read the related article. If you ever want to remove the Slack integration entirely (rather than just disabling individual reminders or notifications), all you have to do is click on the "Uninstall" button in your settings page.